Need a bit more information about the image you are working on. If possible post the file. Removing the background depends on how complicated the backgound is. Single colour is easy. Then when you say make the text transparent, what do you mean? Fill the text with an image or pattern? or...? A search for clearlogo.png just comes up with text on a transparent background. Is that what you want? Color menu -> color to alpha : white is the default, so for your images nothing to change. Here is a before and after combined screenshot and the dialog you see. But those images of yours are horrible, the large one must have been scaled up some time from a smaller image. You can see small areas between the letters that will need cleaning up. The small image is worse. There are many artifacts around the lettering. A way out? maybe better images to start with, or some careful erasing at the pixel level. Then make sure you export as a png which will preserve the transparency. I still make DVD's although not so many these days. 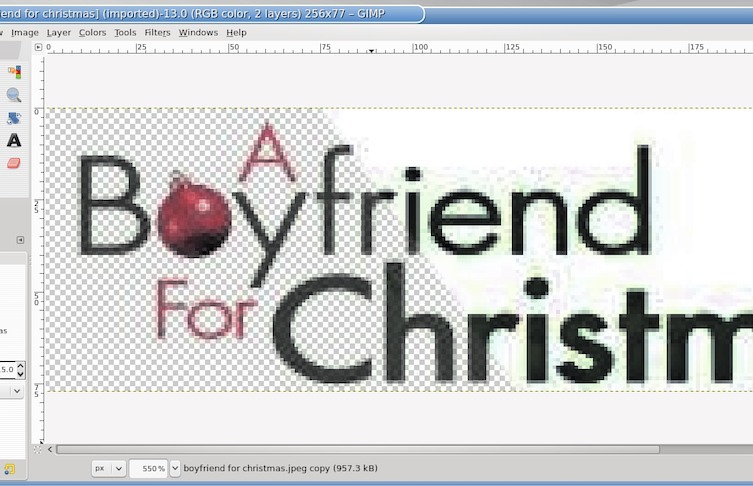 For menus and printing disks, I sometimes steal an image from the video, but text is always new using Gimp or Inkscape. I would prefer to create a new logo, trying to reproduce the original. What size background image are you using? Do the images background / titles have to be separate as that previous link? Not difficult from scratch, but more than just removing a background. You will need to know a bit about creating text effects. A quick couple of lines of text, while you were replying. Not difficult but you do need to know how Gimp works. That is a more the sort of image to work with. To remove the background from that. Add an alpha channel to the image, jpegs do not support transparency. 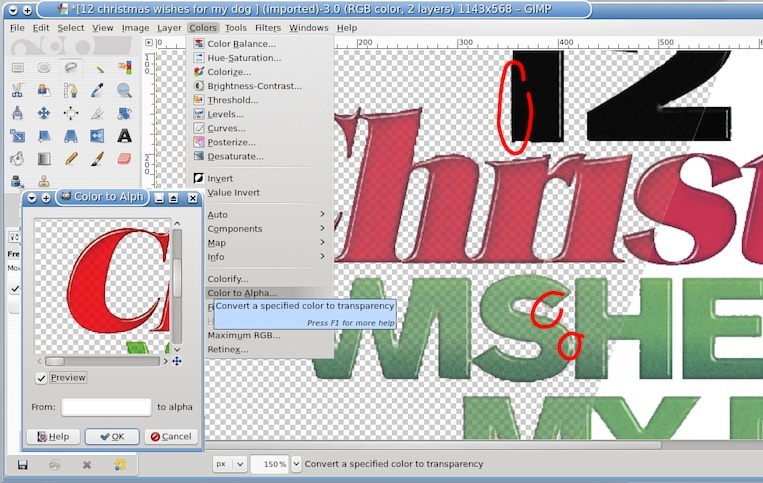 Use color select tool in add mode to select the text. You might find that you need to grow the selection by a pixel. The bauble either carefully go round it with the freeselect tool in add mode or I used the quick mask to "paint" a selection. Once happy with the selection, invert the selection, and cut it. If you still have Gimp 2.8 installed. Find the folder C:\Users\your-id\.gimp-2.8 and delete it. That puts Gimp 2.8 back to 'as-just-installed' state. Start it running, leave it well alone until it finds all the fonts etc and it starts up in default 3 window mode. Use the Window menu -> single window mode for a single window.